The Electro Harmonix Bass Clone Chorus Guitar Effects Pedal is a compact chorus pedal that allows you to inject some modulation into your tone, going from subtle to extreme and everywhere in between. As with all Electro Harmonix pedals, the settings are laid out intuitively, enabling you to get to grips with the unit easily and take advantage of the power that lies within. The Electro Harmonix Bass Clone Chorus Guitar Effects Pedal is modelled on the Small Clone effects pedals, with some added features designed to meet bassist's demands. There is a greater range of modulation depth, with added bass and treble EQ controls to shape your output, whilst a crossover switch decreases the amount of low frequency modulation. Therefore, you can create greater articulation in the bottom end with exceptional note definition. The Treble control affects the entire signal, whilst the Bass control only alters the dry signal. Used together with the crossover switch, you have everything you need for a sublime chorus effect. The Depth control sets the modulation amount, whilst the Rate sets the modulation speed. Whether you want to create a graceful, shimmering soundscape, or create a deeper impression with the chorus. Again, when used in conjunction with the Bass, Treble and X-Over controls, you have a huge tonal library to play with. Getting started couldn't be easier. Simply connect your bass to the input jack, and connect your output to your amp or the next pedal in your chain. All you need is either a standard centre-negative 9VDC power supply or 9V battery, and you're good to go. The footswitch offers a reassuring click underfoot. EHX has employed True Bypass so that your dry signal remains unblemished when the pedal is not engaged. 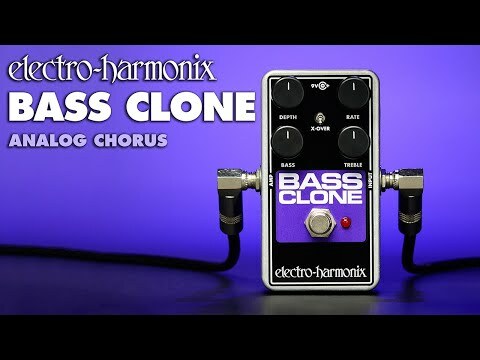 As we've come to expect, Electro Harmonix have built the Bass Clone to take the abuse that comes with life on the road. The rugged and resilient die-cast chassis guarantees that clumsy footwork will be forgiven during energetic gigs. The compact footprint of the pedal means that it will slip into any pedalboard setup quite comfortably.